Although the overlapping of different historical perspectives and experiences is most important for Koselleck, it is the historical depth he identifies in architecture that we want to explore. Transformations in style, changes in function, and the weathering of the surface are all means by which the passage of time is inscribed onto architecture. Thus, the urban environment can be defined as a marker of historical events as much as it is the site of such events. It is exactly this quality, by which history is unwittingly and unceasingly recorded upon the architectural surface (thus providing depth), that makes architecture compelling for historical research as well as for historiographic investigations. This essay will briefly consider three architectural projects in post-World War II Europe: the Torre Velasca, a mixed-use skyscraper in Milan; the Stalinallee in Berlin; and the Plug-In City project by the British group Archigram. On the one hand, these three projects are paradigmatic of the general effort to re-conceive history within post-war Europe - an effort that was intended to separate the present from the immediate past and its associated symbols, motives and styles. On the other hand, these works of architecture should also be read as examples of the diversity of architectural practices at that time. While the Plug-In City exemplifies the world-wide interest in megastructures, which were to provide a dynamic environment free from cultural norms and independent of the existing urban environment, the Stalinallee illustrates the European trend towards finding new meaning within the city-center. Alternatively, the Torre Velasca embodies the struggle to redefine modern architecture by integrating a concern for context into the technological idealism that had defined the movement during the 1920s and 1930s. For each case we will refer to aspects of the particular local situation; its spatial articulation and the manner in which it frames a certain social condition; and its technological means, which embody both real technical knowledge as well as the representation of such knowledge. By approaching these projects as both historical documents and as the sites of historic events, this paper will demonstrate how they can be used to study the architectural culture of the post-war era as well as specific political, social, and economic conditions that reflect broader trends within Europe at that time. Located in central Milan and designed by the firm BBPR (comprised of Gianluigi Banfi, Ludovico Belgioso, Enrico Peressuti, and Ernesto Rogers), the Torre Velasca is a potent example of the work of Italian architects during the post-war years.3 Although not completed until 1957, planning of the building began in 1950 when the RICE corporation acquired a 9,000 square meter lot, a mere 450 meters from the Duomo. Originally conceived as a business park for American companies, the plans for the site were changed due to a lack of corporate interest; instead, a mixed-use skyscraper was constructed, com-bining commercial space with luxury residential units. While BBPR’s first design called for a glass and steel skyscraper along the lines of the corporate towers then being constructed in the United States, this proposal was rejected due to the prohibitive costs of steel at that time. Instead, Rogers and his partners turned to reinforced concrete, a material that was widely used in Italy and available in a variety of pre-fabricated elements. 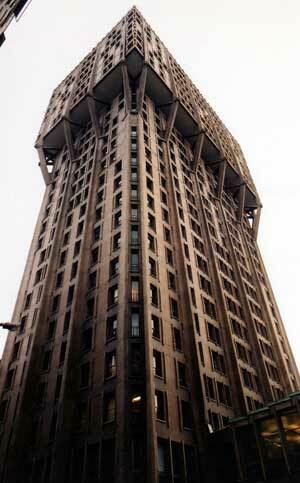 As it was finally constructed, the Torre Velasca consists of 26 stories and rises to a height of 99 meters. Its distinctive form is composed of two parts: the lower 18 stories, narrowly rectangular in plan, and the upper 8 floors, which expand dramatically beyond the walls of the lower portion and are supported on massive concrete struts that rise from the very base of the building. According to Rogers, the unique form of the building was determined by a rigorous analysis of the functional requirements; as a result, the residential units are located in the expanded upper floors, while the lower portion of the building is devoted to office-space. The outer appearance of the Torre, however, reflects as much its functionalism as a heightened sensitivity to the symbolic power inherent in any archi-tectural form. Rogers made this clear when he stated that, “Our main purpose was to give this building the intimate value of our culture - the essence of history [...]. 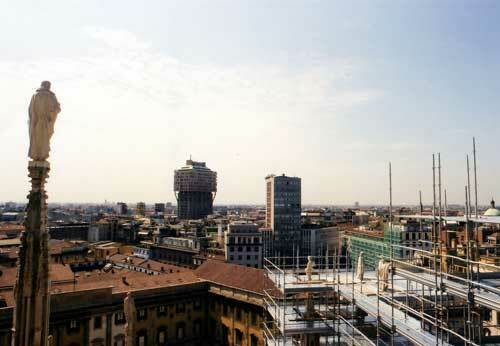 It is at Milan’s very historical centre and we found it necessary that our building breathe the atmosphere of the place and even intensify it.”4 In particular, the “blossoming” shape of the upper stories and the pinkish-gray stone used as cladding serve to establish a clear formal relationship between the Torre and the surrounding structures, remnants of the city’s past. Additionally, the concrete struts that vertically delineate the façade of the tower and support the upper floors, function both as essential structural elements as well as symbols of the technological advances that allowed for construction of such a building - one of the earliest to mark a skyline still dominated by the spires of the Duomo. With these features, the Torre can be seen to articulate an architecture that is as modern as it is sensitive to its context. Instead of imitating its surroundings, the Torre builds their analogue, delivering, in turn, an eloquent critique of the modernist dream of a tabula rasa. In both its physical form and its historical development, the Torre Velasca embodies a range of themes that are central to the study of post-war European culture. While the evolution of the design reflects the harsh reality of material shortages during those years, it also illuminates deeper issues within Italian culture. In particular, the development of an architecture that was so explicitly responsive to its context (both historical and physical) exemplifies the widespread effort to move contemporary society forward by “reconnecting” it to history, specifically a pre-war culture that was believed to be unsullied by the atrocities of Fascism. Exhibiting a contextual modernism, one responsive to images of the past as well as dreams for the future, the Torre stands as a concrete element in the architects’ effort to re-establish a hopeful vision of the future. 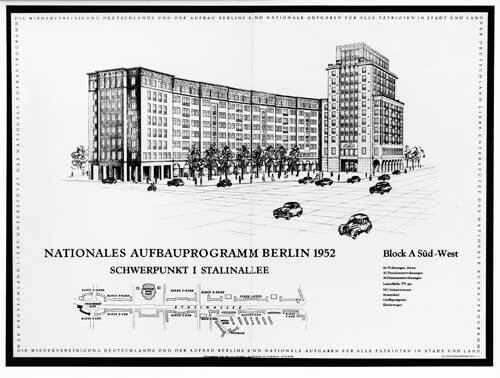 The architects of the Stalinallee (Hermann Henselmann, Richard Paulick, Egon Hartmann, Kurt W. Leuch, Hans Hopp, Karl Souradny) designed the street with an ensemble of aligned building façades that effectively subordinates the single building to the broader urban vision.7 This approach reflects the “Sixteen Principles”, which assert that “Urban planning is the foundation of architectural form-giving”, and that the “city’s appearance, its individual artistic form, is determined by plazas, major streets, and significant buildings in its center”.8 By creating a ninety-four-meter wide axis through the city, which severed and realigned many existing streets, the architects created an urban form that intentionally set itself against the pre-existing urban context. For the architects and politicians involved in the project, architecture was to become a tool for the creation of a unified urban structure through which the city should be read. As the architects asserted, “the city must express the social order”. In practice this meant the design and construction of an environment that would literally reflect the “new beginning” inherent in the establishment of East Germany’s new political identity. What in architectural terms was formulated as a cohesive urban ensemble, including aligned classicizing façades and up-to-date functional housing, represents a new social, cultural and political framework according to which the widely destroyed city of Berlin was to be reconceived. Influential for several years, the “Sixteen Principles” were superseded in the mid-1950s when Nikita Khrushchev outlined a new direction for architecture and urban planning that adopted a functionalist approach in order to meet the demand for inexpensive building systems.9 The new section of the street that was constructed primarily during the 1960s, and then renamed Karl-Marx-Allee, exemplifies this new urbanism. 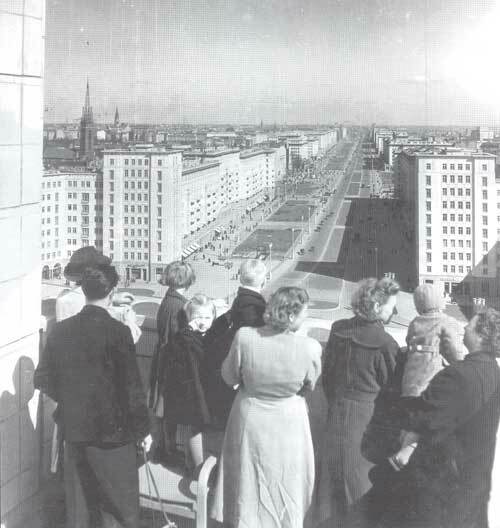 With its bare, single-slab housing blocks, this one-hundred-twenty-two-meter wide promenade does not continue the constricting linearity of the Stalinallee; instead it privileges free-standing buildings that allow for diverse views through the Plattenbausiedlung. 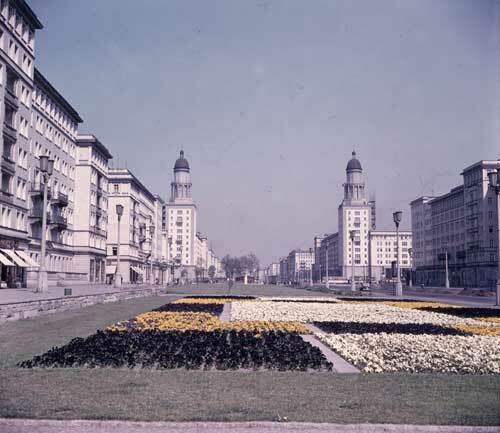 As a result of these shifts, the area around the Stalinallee can be read today as a field of contrasts between the freestanding building blocks of the 1960s, the classicistic façades of the 1950s, and parts of the Mietskasernenstadt of the 19th century. While each group of designers attempted to foreground its own ideology and suppress the others, the continual shift of agendas has effectively preserved fragments of each. This inevitable process of historical change has created an urban character that, against all ideological intentions, remains fractured and layered, making possible a reading of the city as palimpsest. Unlike the Socialist Realism of the Stalinallee, which was clear in its intention, our third example is an unbuilt project that embodies a provocative uncertainty regarding the future of European society. Plug-In City was conceived over a period of approximately four years in the early 1960s by the British architectural group Archigram.10 Composed of Peter Cook, Warren Chalk, Dennis Crompton, David Greene, Ron Herron and Mike Webb, Archigram did not function as a traditional architectural practice; instead of buildings, the group produced a journal that presented their drawings, photographs, and collages, along with a few brief polemical texts. Between 1961 and 1974, nine issues of “Archigram” appeared, each dedicated to a particular theme exploring the role of technology within contemporary society. As a result of their wide distribution (“Archigram” was distributed throughout Europe, North America, and Japan) and their visionary content, the drawings of Archigram offer a compelling opportunity to explore the architectural fantasies of an entire generation of architects. This image, protected by copyright and by watermark, is for reference purpose only. Arguably Archigram’s best known work, Plug-In City was defined by its creators in the simplest of terms: “The Plug-In City is set up by applying a large-scale network-structure, containing access ways and essential services to any terrain. Into this network are placed units which cater for all needs. These units are planned for obsolescence.”11 The project itself consists of a large number of drawings and models that offer glimpses of what appears to be a city of the future - views that range in scope from the smallest details of construction to sweeping panoramas. Regardless of the scale, however, all of the drawings show a complex agglomeration of large-scale skeletal structures, each supporting innumerable service “pods”, as well as soaring cylindrical towers, zig-zagging roads and railway lines, and, hovering above all of these, large cranes that replace each element when its utility ends. Within these scenes, countless human figures move “freely and efficiently” through the megastructures that surround them. Although Plug-In City and the work of Archigram in general offer an ideal opportunity to explore myriad aspects of post-war architectural culture, for our purposes it is the ambiguous nature of the urban environment depicted by Plug-In City that is most important. Using images and ideas collected from such diverse sources as comic books, science fiction novels, and technology trade journals, the project not only stands as an assault on the conventions of the architectural profession, but also vividly illustrates the tensions present in post-war society regarding new technologies of mass-communication and industrial production. By depicting these technologies in their distinctive and particularly provocative drawings, Archigram’s utopian visions carry these new developments to their logical extreme as much as they ironically question their validity. The aim of our discussion has been to demonstrate how architecture can serve as an important resource for examining contemporary European history. Put simply, the value of architecture as a documentary source is not circumscribed to a strict professional field. Indeed, as we have attempted to show, buildings should be understood to embody broader social concerns in addition to the particular details of the building and design trades. With these three projects one can compose a map of post-war architectural tendencies as well as investigate the social, political, and economic conditions of Europe in the years following the Second World War. Each of the examples (the utopian city of Archigram, the heavy-handed urbanism of the Stalinallee, and the reflective urban architecture of the Torre Velasca) demonstrates a different concern for the relationship between architecture and its context, which has been broadly defined to include local conditions, social habits, and technological means. While the Torre Velasca reflects a selective reinterpretation of historical forms that parallels the effort to overcome the memories of Fascism and the war in post-war Italy, the Stalinallee was an autonomous urban construct that functioned as a built-version of the political dreams of the newly established GDR. As an unbuilt project, on the other hand, Plug-In City presents a vivid illustration of the tensions within postwar culture while simultaneously offering little hope for their reconciliation. Obviously, a critique of modernism and a longing for a new environment, set apart from the traumas of the past, can be observed in all of the projects. In addressing these themes, these projects present a literal visualization of the different points of departure that post-war Europe utilized in its search for a hopeful vision of the future, while simultaneously documenting the historical changes that this search provoked. By becoming synonymous to general European trends in this manner, architecture (as historical event) places itself between the historical condition and the interpretation of this condition by the historian. What Koselleck describes as the tension between history and language - realms that can never be synchronized in historical research - can be bridged by architecture, which in the study of history can function as visualization of historical tendencies. Once understood as positioned between the “methodisch unauflösbaren Spannung”12 (methodically indissolvable tension) of language and history, the analysis of architecture offers itself as a mediator between historical happening and scholarly pronunciation. Whether comparing a new building to an existing urban context (as in the Torre Velasca), studying the development of architectural projects over time (as in the Stalinallee), or examining drawings that contrast a utopian vision with current social and cultural conditions (as in Plug-In City), the historical depth in architecture is always apparent. 1 As “architecture” is the basic unit of construction within the larger urban environment, no distinction will be made between the building of architecture and the creation of the urban environment. 2 Reinhart Koselleck, Vergangene Zukunft. Zur Semantik geschichtlicher Zeiten, Frankfurt a.M. 1979, pp. 9-10. 3 For more information on the Torre Velasca see: Oscar Newman, New Frontiers in Architecture: CIAM ’59 in Otterlo, New York 1961; Manfredo Tafuri, History of Italian Architecture, 1944-1985, Cambridge 1989; Ezio Bonfanti/Marco Porta, Città, museo e architettura: il gruppo BBPR nella cultura architettonice italiana 1932-1970, Firenze 1973; Luca Molinari/Paolo Scrivano, Postwar Italian Architecture, 2G International Architecture Review, no. 15, Barcelona 2000. 4 Rogers quoted in Newman, New Frontiers in Architecture (fn. 3), p. 93. 5 The selective engagement with the historical heritage, which was equivalent to the Soviet palace style, occurred in Berlin with a classicism that recalled Schinkel’s architectural legacy. 6 It is instructive to compare the East German architectural principles regarding the city center to those of CIAM (Congrés Internationaux d’Architecture Moderne), which coincide both thematically and temporally. For more information see: Jacqueline Tyrwhitt/Jose Luis Sert/Ernesto N. Rogers, The Heart of the City: Towards the Humanization of Urban Life, New York 1952. In reference to its monumentality, the street reflects an equally important transnational trend. See José Luis Sert/Fernand Leger/Sigfried Giedion, “Nine Points on Monumentality”, 1943; Louis Kahn, “Monumentality”, 1944; Walter Gropius, “Eight Steps towards a Solid Architecture”, 1954. 7 For more information on the Stalinallee see: Werner Durth/Jörn Düwel/Niels Gutschow, Architektur und Städtebau der DDR, 2 Bde., Frankfurt a.M. 1998; Jörn Düwel, Baukunst voran! Archiektur und Stadtplanung im ersten Nachkriegsjahrzehnt in der SBZ/DDR, Berlin 1995; Bruno Flierl, Gebaute DDR. Über Stadtplaner, Architekten und die Macht. Kritische Reflexionen 1990-1997, Berlin 1998; Niels Fritsche/Rolf Toyka/Manuel Cuadra, Berlin Karl-Marx-Allee: Hintergründe ihrer Entstehung, Probleme, Visionen, Hamburg 1997; Simone Hain, Warum zum Beispiel die Stalinallee? Beiträge zu einer Transformationsgeschichte des modernen Planens und Bauens, Berlin 1999; Peter Noever (Hg. ), Tyrannei des Schönen. Architektur der Stalin-Zeit, München 1994; Joachim Palutzki, Architektur in der DDR, Berlin 2000; Andreas Schätzke, Zwischen Bauhaus und Stalinallee: Architekturdiskussion im östlichen Deutschland 1945-1955, Braunschweig 1991. 8 Joan Ockman/Edward Eigen, Architecture Culture, 1943-1968: A Documentary Anthology, New York 1993, p. 128. Originally published in Planen und Bauen 9 (1950), pp. 288-293. 9 For more information on economical design approaches and industrial building technology see: Christine Hannemann, Die Platte: Industrialisierter Wohnungsbau in der DDR, Wiesbaden 1996. 10 For more information on Archigram see: Peter Cook, Archigram, New York 1999; idem, Experimental Architecture, New York 1970; Dennis Crompton, A Guide to Archigram, 1961-1974, London 1994. 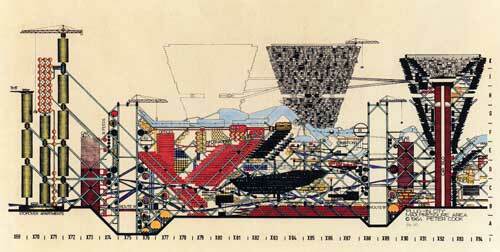 11 Cook, Archigram (fn. 10), p. 39. 12 Koselleck, Vergangene Zukunft (fn. 2), pp. 300-301. Alexander Eisenschmidt, Jonathan Mekinda, Architecture as a Document of Historical Change. Three Examples from Post-war Europe, in: Zeithistorische Forschungen/Studies in Contemporary History, Online-Ausgabe, 1 (2004), H. 3, URL: http://www.zeithistorische-forschungen.de/3-2004/id=4459, Druckausgabe: S. 438-447.